Holiday Luncheon and Scholarship Fundraiser - Council of Rockford Gardeners, Inc. Proceeds from this fundraiser benefit the Council of Rockford Scholarship Fund for Kishwaukee College Horticulture students. 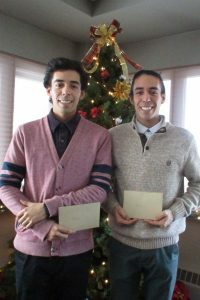 The Council of Rockford Gardeners was honored to present two scholarship awards at the Dec. 5 Christmas luncheon held at Mauh Nah Tee See Country Club. Congratulations go to Andre Vallejo and Ulysses Vallejo, who attend Kishwaukee College in Malta, IL and are previous recipients of the scholarships. They have again proven themselves academically as well as in their community work. Andre is pursuing a landscape design degree and nursery management certificate. Ulysses’ degree will be in greenhouse horticulture and a certificate in sustainable horticulture. The 2019 Holiday Luncheon and Fundraiser will take place on Dec. 11, 2019. Check back for additional information.